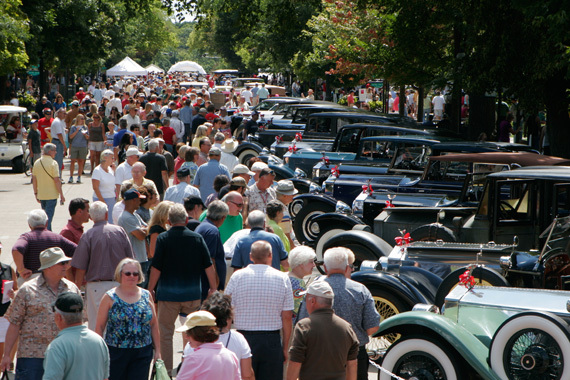 The 2013 Concours d’Elegance is scheduled for Sunday August 25 starting at 10am and ending at 4pm. The 2013 Concours d’Elegance is a classic car enthusiast’s dream come true. It is a large display of classic, antique, and unique modern cars that come here from all over the country. The cars at the Concours d’Elegance are come from owners and car clubs who are invited to participate by the Geneva Concours d’elegance NFP. The Geneva Concours d’elegance NFP is a 501 (c)(3) charity registered in Illinois so all contributions them are tax deductible. The Concours d’Elegance is well managed, there is a sponsors list about a mile long and this year the event beneficiary will be the Living Well Cancer Resource Center. The Living Well Cancer Resource Center is a community-based, not-for-profit center dedicated to providing people with cancer, their families and friends, the support and educational services they need when going through a difficult time. The cars will be displayed along Third Street from Sate Street to South Street, so driving around Geneva is going to be a bit tougher that day than normal. Judging starts at 9am but the event will not be open to the public until 10am and admission is free. The awards for the event winners will take place at 3pm between Franklin and South Street and the 2013 Concours d’Elegance will conclude at 4pm. Featured at this years event will be automobiles that traveled down the original Lincoln Highway in it’s first decade of existence. The Lincoln Highway was the country’s first transcontinental improved highway. Work on the highway began in 1913 marking this the 100th year of the Lincoln Highway. The Lincoln Highway has a real neat history worth looking into a part of it ran right around Geneva. Also featured will be the 50 anniversary of the rear-engine Porsche 911. The Geneva Concours d’Elegance website details the Friday and Saturday events that you can attend with a fee. I do not know if it is too late or what kind of availability is left so soon before the weekend. This is the first year I have heard of the Concours d’Elegance and was rather surprised that such an event has been held in Geneva for the past several years. The event brings in a number of unique and rare automobiles, some are so rare this event is our only chance to view them. I love old and rare automobiles, we have had the unique opportunity to see some here at the office and at various museums. We have a few patients who collect cars and on vacation have gone to museums like The Henry Ford which have a very large automobile collection outside of Ford brand cars. I am definitely going to try to attend this and I hope to see you there. If you get there early enough head over the Geneva French Market and get some fresh, locally grown produce. I will try to follow-up this post with some pictures of the event.